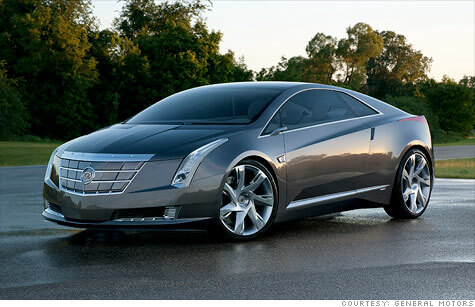 GM will build a production version of its Cadillac Converj Concept to be called the Cadillac ELR. NEW YORK (CNNMoney) -- GM said Wednesday that it will go forward with plans to build a production model of an electric Cadillac luxury coupe. The Converj Concept, which was first presented at the 2009 Detroit Auto Show, will be called the Cadillac ELR. The Cadillac ELR will be GM's luxury version of the Volt. "The concept generated instant enthusiasm," Vice President-Cadillac Marketing Don Butler said. "Like other milestone Cadillac models of the past, the ELR will offer something not otherwise present -- the combination of electric propulsion with striking design and the fun of luxury coupe driving." The vehicle, which is currently in development, will be powered by a lithium-ion battery, an electric drive unit, and a four-cylinder engine-generator similar to the Chevy Volt. The Cadillac ELR will run primarily on electricity -- saving consumers the cost of gasoline and reducing emissions. Specific details about performance and price have yet to be announced. "There's no mistaking it for anything but a Cadillac. An aggressive, forward-leaning profile and proportion showcases a uniquely shaped, modern vision of a personal luxury 2+2," GM (GM, Fortune 500) Vice President of Global Design Ed Welburn said, referring to a coupe that seats two up front and two in the rear. In addition, Cadillac says it will display another concept car on Thursday prior to the annual Pebble Beach Concours d'Elegance car show.